The latest Magerealm update is introducing a new set of Fashion to the game, and this one is sure to become a fan favorite! At some point we’ve all fantasized about being a ninja, right? Or at least played a game with a ninja? Are you team Scorpion or team Subzero? Well whether you prefer silent assassinations or just want to go wild like Ryu Hayabusa, Magerealm players are in for a treat! 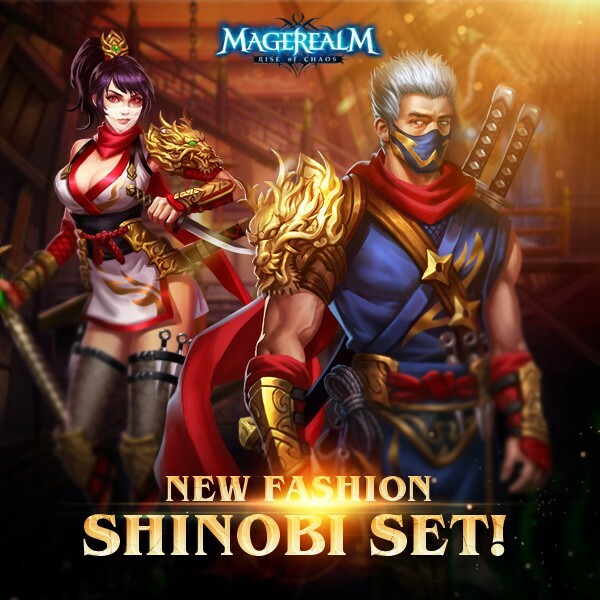 Take on the appearance of these mysterious and legendary shadow warriors from the Far East with the new Shinobi Fashion! Transform your characters into true assassins in the latest Magerealm update! Your enemies will never see you coming! Are you ready to unleash your inner Shinobi? Let us know on the official forums, and follow Magerealm on Facebook or GTArcade and visit the official forums to get the latest news and participate in rewarding events. Come experience an epic fantasy world of magic in this free to play action MMORPG!